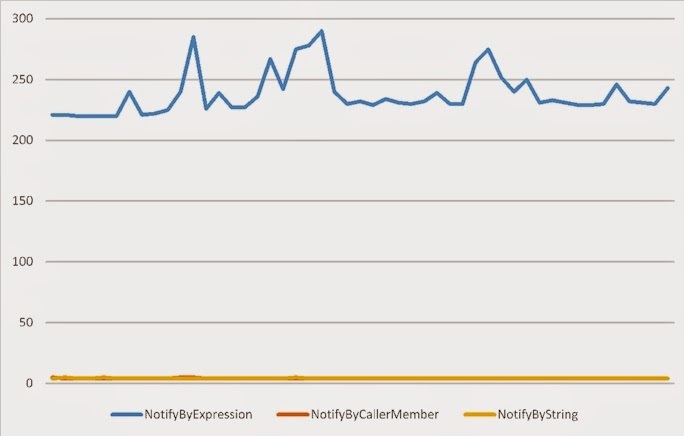 Introduced in .NET Framework v4.5 (as a C# 5.0 compiler feature), the CallerMemberNameAttribute allows you to determine the method or property name of the caller of a method. This comes in very handy if you’re adding logging code, or in the case of with WPF you’re using models based on the INotifyPropertyChanged interface, where you need to fire the PropertyChanged event passing along the name of the property that’s changed. Pass a hard-coded string to identify the property name. This has clear drawbacks – what if the property name changes/identifying code dependent on the property? There are plenty of examples available showing how to parse an expression tree (see below), but be very careful, parsing an expression tree is very, very slow compared to using the CallerMemberName or passing in a string to identify the property. If your application can target v4.5 then, in terms of performance, it’s strongly recommended that you replace any expression tree parsing with the CallerMemberNameAttribute. In order to determine these numbers, I created a suite of tests, that all performed the same task of firing a property change notification change for a collection of 100 objects (each object having two properties changed 200 times). The statistical 95th percentile number of milliseconds for each test was calculated (rather than using a less accurate average) and plotted above. You can see that repeatedly parsing an Expression was more than 50 times slower than the other two methods. Clearly, if you only have a few objects to track or the number of property change is equally low then this will not be such a problem, but as the volumes increase you might notice a difference – and this is before you factor in the time it takes for your observer action to complete. In my case I was simply incrementing a counter to keep the action work to a minimum. Before delving into the test code, I’ll summarise a few basic snippets for the three standard INotifyPropertyChanged implementations. Contrast this with the older style of passing along a string to identify the property. It’s simple, it works, but you have no easy way of checking if the name of bound property changes or the impact of changing that name or how it’s really used – a potential maintenance nightmare. You get the benefits of compile-time checking and it’s easy to determine property usage in your code…but it can be very slow. In order to run the tests, I prefer to use the NUnit framework to create the tests and then run them using Resharper (in a handy single click). Using the Package Manager console, you’ll need to run Install-Package NUnit to get NUnit downloaded from NuGet and referenced in your project. I have a general purpose base class that I often use when creating timed test code, TimedActionBase.cs. The only difference between each of the tests is how OnPropertyChanged is called (it needs a string property in all cases). To create the actual tests I extend the TimedActionBase class further with a NotifyTestBase class. This serves as the core for each notification test. You’ll see that NotifyTestBase overrides the base class’s TimedAction() method. It ensures that for each test, the same number of objects are modified and the same number of times between each CarBase implementation by overriding the factory method CarBase CreateCar(). All that’s required for each scenario is to create a concrete implementation of CarBase and have a new instance of that type returned in the test by overriding CreateCar(int i). You can see that each of the property sets calls SetAndRaiseIfChanged – no need to pass in the property name as the propName string is decorated with the [CallerMemberName] attribute. You can download the full test solution from here. Normally you use Reflection to get hold of types decorated with an attribute at runtime, but the C# 5.0 compiler looks for this attribute when compiling your code.